Hoping someone may be able to shed light on my issue - 6 times now in the past 9 months the engine has simply stopped BUT comes back on a couple seconds later - except for the last time where it just died. First time: July 2018 - driving on the freeway at 70mph, suddenly feel no power - all lights on dash work - but engine stalled for about 2 seconds...it dies and then came back on two seconds later (i concluded the engine lost electrical only because my Scanguage rebooted). Transmission wouldn't shift up or down so I pulled off at the exit and stooped at the light to turn right into a corner gas station - but transmission wouldnt shift out of first gear. Once at the station I turned off the ignition and then started it back up to see what would happen. everything ran fine. Second time: About 4 hrs later exact same thing happened -(engine shut down for 2 seconds and then came back, and scan guage rebooted) so i pulled over, and again Trans wouldnt shift out of first. Turned off ignition and started it back up and everything ran normal. Third time: 2 days later (and bout 480 miles) engine lost power for about 2 seconds and came back, scan guage rebooted again, BUT transmission performance wasn't effected. Forth time: about two months later and 900 miles: Engine paused for about 3 or 4 seconds again and then came back & scan guage rebooted - again no issue with the Transmision. Fifth time: about 3 months later and 1,000 miles - I was driving about 30mph and engine dies...this time it didn't come back to life (no issue with dash lights or headlights) - what a bear it was to brake and turn into a parking lot with no power!!!! Been at the local Dealer for 3 weeks and they cant find anything wrong (again been driving the van about 60miles to see if they can duplicate the issue) - no codes, no issues that they can replicate. 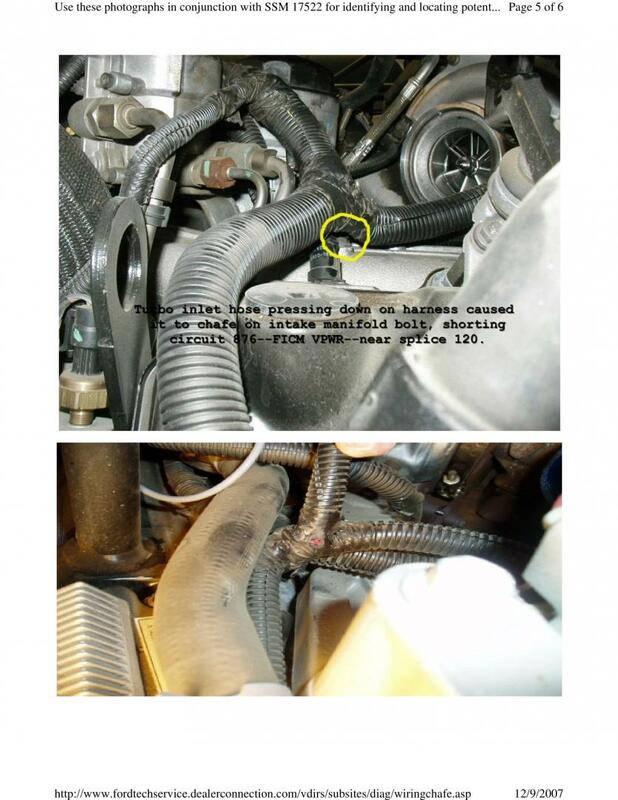 Only advise they offer is replacing the entire engine wiring harness (and thats just a shot in the dark). they've checked connections to make sure nothing is loose and again nothing uncovered - other than this task led to replacing the two starter batteries because they were nearing the end of life. I know electrical issues can be a pain, and this one really concerns me especially if the engine dies while we are driving 70mph on a down grade or a curvy mountain road...so thought i would just throw this issue out to see if any of the "brain power" here has suggestions. My first thought would be a heat caused wiring harness issue as well. Doesn’t sound like most of the typical 6.0 high or low oil pressure related issues. How are the engine-to-chassis ground strap(s)? I've heard of issues before where a bad ground would cause the ECU to lose power intermittently...and then of course there are no codes stored because the ECU lost power. 3. if it's not throwing a code, then maybe it's mechanical - could be a sensor intermittently faulting at operating temperature?!? 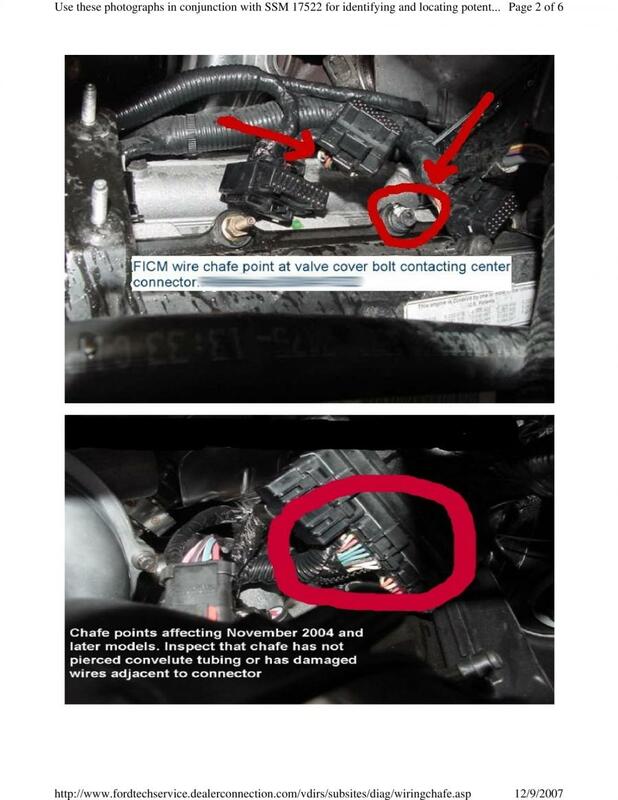 5. the scangauge may be faulty? 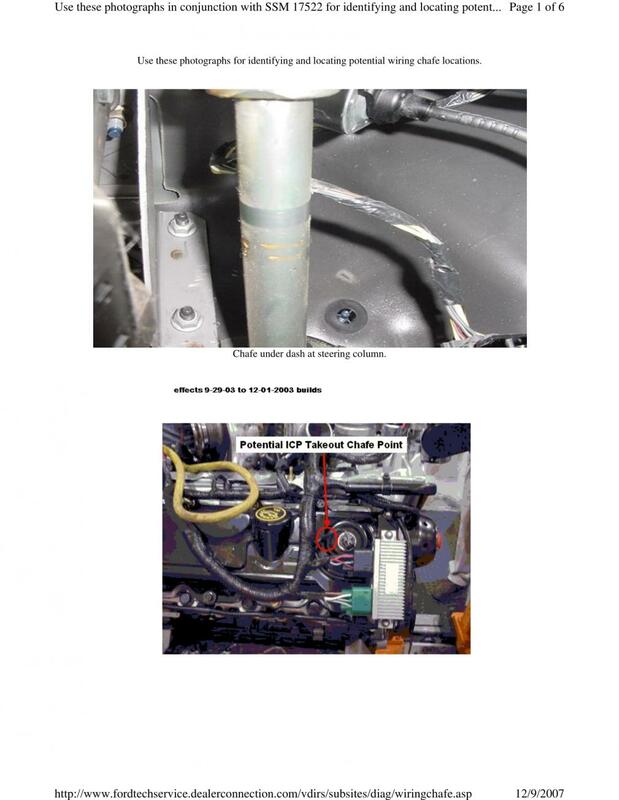 6. fuel - pump, tank, filters, ? 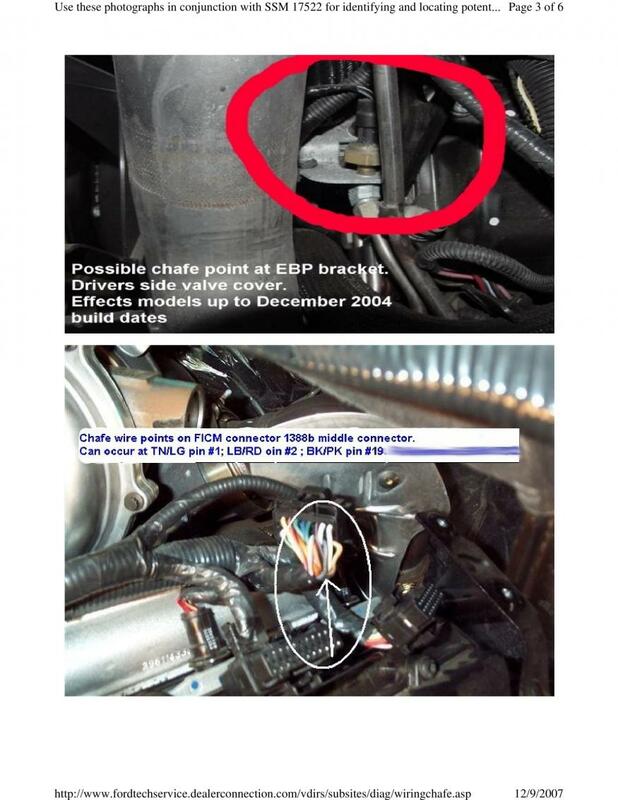 E. https://www.thedieselstop.com/forums/f23/help-6-0l-engine-unexpectedly-dies-41045/ - "Ask your dealer about a flight recorder. Ford does have them and they can put it on your truck and record the event." L. https://repairpal.com/engine-dies-for-no-reason-942 - Also, did the shop do a data stream evaluation, just because there are no codes, does not mean that there is no problem, ( as you are aware ) a system could be barely functioning. There is a Service Bulletin for performance problems that are similar to yours. The number is 09-24-3. It involves reprogramming the engine computer, injection module and transmission module for your 6.0 liter diesel. I would go to a shop who can read the data stream for Diesel Systems and who knows about Ford Diesel Diagnosis. There should be some independent shops in your area where this is true, as there are several in my area. And these images are from the "harness-chafing.html"
Because you're having multiple failures with multiple systems, I'd start by checking every single main connector. These are generally the bolted connected, but some of them are secured with large plastic tabs, which occasionally break off. Because you're past the 10 year mark, I'd seriously consider doing an engine harness replacement at some point. These kinds of intermittent electrical problems can sometimes burn up more diagnostic hours than just doing the harness R&R. WOW unreng - Thats one comprehensive response - and much appreciated! Printing a copy to present to them. I will definitely inquire about the "data stream evaluation" and the "reprograming". Dealer did check all connections, thats why they've suggested the wiring harness (they ruled out the new BD FMIC since it was replaced with the new engine just 3 years ago). We did also consider the Fuel system, but I recently had the filter changed, and they said if the fuel pump was going it wouldn't be this intermittent, and if it was the fuel system they said I would get a code- Driving conditions were all normal landscape, flat surface and speeds were between 30mph and 70mph with no load on the vehicle. Certainly will take all your suggestions to them, but will also be searching for another shop that may be able to provide another perspective. ORV -I'll have them check the "engine-to-chassis ground strap(s)", but believe they did that when they replaced the batteries on my first visit to my Local dealer. I'll request them to check again for piece of mind...I sure hope it could be that simple! 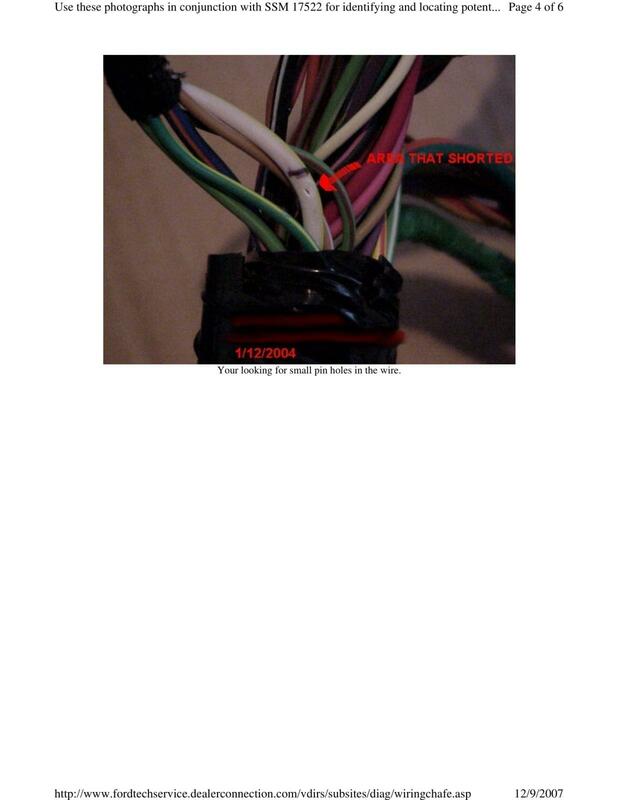 carringb - I'm no mechanic, but My thoughts align with your deduction...chasing an electrical problem imbedded in the harness may take longer than just replacing it especially since it only occurs every once in a while...they may never be able to figure it out. In hindsight wish i had done this with the engine replacement, but didnt see that mentioned anywhere in all my research at the time. Live & Learn! Thank you all for your time and interest - some great suggestions! I had the wire harness replaced and that fixed the same problem you're having. A year later I had the harness heat wrapped when I finished the engine bullet proofing. It helps with the rubbing as well as the heat under the hood. I've seen numerous threads about similar issues with the harness and was warned about it failing about at 100K. I got to about 85K miles before I started seeing issues. While they were in there I had a high performance FICM installed in prepping for the bullet proofing job scheduled for a year later. daveb, I hate to validate "misery loves company", but knowing you had the same issue and a new harness resolved the problem makes me a little more confident this is the route to take. First I'll have them check a couple of the other possible culprits as mentioned in earlier responses just to rule out a potential quick fix. I just replaced the harness running from the FICM to transmission and found this short to ground. 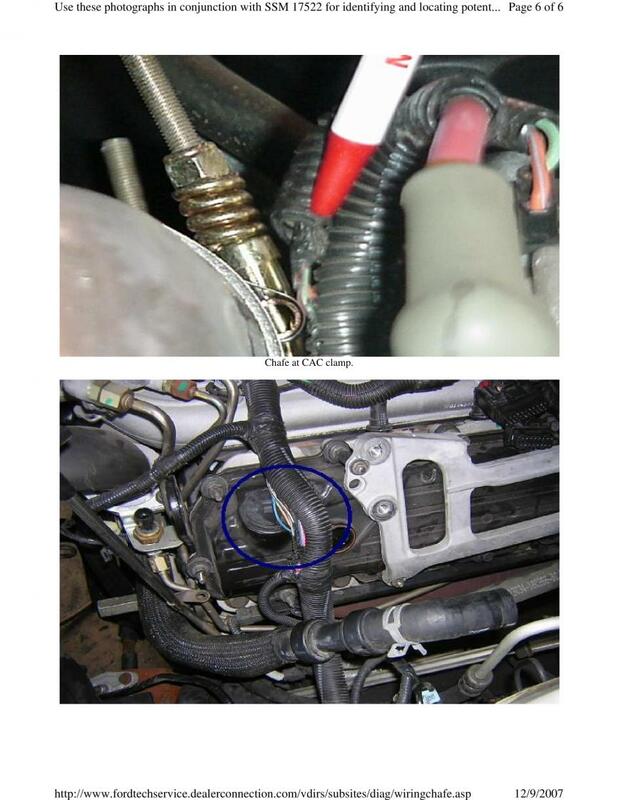 The short was in a section of harness where the pictured bundle of wire passed down behind the heat shields for the up-pipes to the turbo. Despite the heatshields, the bundle of wires were all fused together from the heat and definitely getting on the brittle side. Also a 2006 with about 135K on the odometer. All it took was about 6-8 hours of disassembly and reassembly, week or two of intermittent home diagnostics and forum reading, 4 months of procrastination, about $250 and I'm back on the road!